For the last eight years, Kevin McGeehan has been the right-hand man for Richmond University head coach Chris Mooney, helping guide the Spiders to two NCAA tournaments and one appearance in the Sweet 16. Mooney was in town on April 11 to support McGeehan — his friend and colleague — as he took the next big step in his coaching career, head men’s basketball coach at Campbell University. Prior to the 2008-09 campaign at Richmond, McGeehan was promoted from assistant coach to associate head coach. Among the highlights for the Richmond program during McGeehan’s time on staff was consecutive NCAA tournament berths, including a trip to the 2011 NCAA Sweet 16. The Spiders were ranked in the national top-25 polls in 2010 and set a school record with 29 victories one year later when they won the Atlantic-10 Conference championship. McGeehan assumes control over a program that has called the 3,095-seat Gore Arena inside the Pope Convocation Center home since November 2008. Over the last five years, the Camels have amassed a 48-24 (.667) record at home. He said he did his research on the program and the school prior to interviewing for the position, and he instantly viewed Campbell as a school and program on the rise. After his first meeting with Athletic Director Bob Roller, McGeehan said he was hooked. 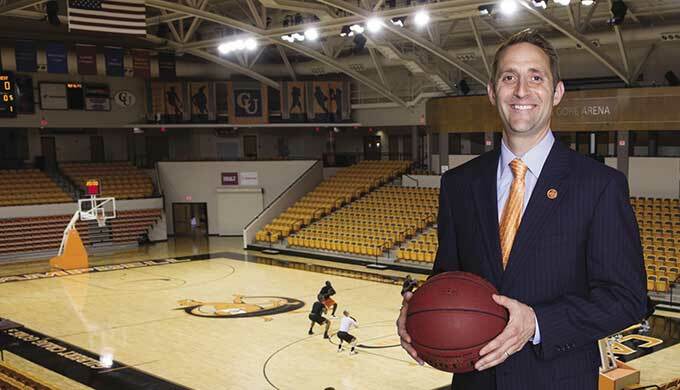 A few months into his new gig as head men’s basketball coach at Campbell University, Kevin McGeehan took the time to discuss the outlook for his team. McGeehan: It’s been great. I like the group of guys we have. They are good kids and have been very responsive to coaching. Our guys have been working hard, and they’re learning a lot. We’ve taught a lot and they’ve retained a lot in five weeks. To their credit, it’s a substantial amount of information to process. Everyone in the community, administration and on campus has been so supportive. HOW DO YOU DEVELOP TEAM UNITY? McGeehan: When we brought in recruits for official visits, we held cookouts and played whiffle ball. We want our recruits and players to feel the vibe of the group and have them want to be a part of it. We want to foster an environment of people wanting to be together. You can do that through ordinary experiences like playing horseshoes or cooking out. McGeehan: We’ll place a premium on skill-level and athleticism. In a perfect world, you’d like to balance your roster with recruits who can learn from the returning players. We’ve talked with prospects about the fact that it’s an exciting time to be a Campbell, being on the ground floor with a new coach and being a cornerstone piece in the program. CAN YOU TALK ABOUT THE 2013-14 SCHEDULE? McGeehan: The schedule we inherited is very challenging with games at Cincinnati, N.C. State, Appalachian State, Robert Morris and UNC Wilmington. We’ll have ECU and North Carolina Central at home and have been able to add a home-and-home series with Georgia Southern. The schedule will be challenging with some winnable games in there as well.